Chinese President Xi Jinping, one of the seven newly elected members of the Politburo Standing Committee, attends a press event at Beijing's Great Hall of the People on Oct. 25, 2017. China’s ruling Communist Party has unveiled a new leadership lineup for its top decision making body, the Politburo Standing Committee, the apex of power in the world’s second largest economy. In a break with past precedence, however, there was no clear successor among the new appointees, yet another sign some analysts say of Chinese leader Xi Jinping’s uncontested power in authoritarian ruled China. Zhang Ming, a political analyst who recently retired from Beijing’s Renmin University, said as Xi has shifted away from collective leadership and become the party’s “core leader,” the role of the Standing Committee members has become meaningless. “In the Xi Era there is no such thing as a successor or a need for one,” Zhang said, adding that it is difficult for the public to predict what might come next. Premier Li Keqiang and Xi were the only two to remain in their posts in the Standing Committee as five other members – including the nation’s top graft buster Wang Qishan – were retired. 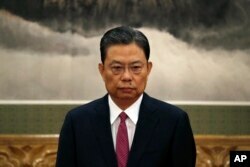 Wang, a man referred to by some analysts as China’s second most powerful, has been at the forefront of a sweeping anti-corruption campaign that has not only seen more than a million rank and file members of the party punished, but taken down political heavyweights and smashed party cliques as well. Whether he will slip quietly into retirement or retain some other senior role was not immediately clear. Zhao Leji, one of the seven newly elected members of the Politburo Standing Committee, attends a press event at Beijing's Great Hall of the People on Oct. 25, 2017. In addition to Zhao, four other prominent party politicians were chosen and include Vice Premier of the State Council Wang Yang, Shanghai Party Secretary Han Zheng, as well as two of Xi’s close advisors, Li Zhanshu and Wang Huning. Both Wang and Li Zhanshu, a long-time friend of Xi, have accompanied China’s leader on many of his trips overseas and are frequently seen at his side. Both Xi Jinping and Li Keqiang were appointed to the Standing Committee in 2007 following the 17th Party Congress, five years before they took on their current roles in what was then an openly telegraphed political succession. Now, things are less clear. Xi Jinping’s name and political vision for China has been written into the party’s constitution and during the 19th Party Congress, he galvanized the party’s focus on ambitious goals that stretch to the middle of this century. Analysis of what his ultimate aim may be ranges widely, from state media’s portrayal of him as a leader ushering in a new historic era for China to critics who see him angling toward dictatorship. Absent from the list that was announced Wednesday were two politicians – Chongqing Party Secretary Chen Miner and Guangdong Party Secretary Hu Chunhua, widely seen as possible candidates to succeed Xi. 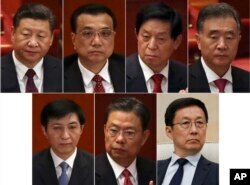 Both Hu and Chen were given seats on the Politburo, a 25-member body one rung lower than the Standing Committee. Alexander Neill, a senior fellow at the International Institute for Strategic Studies Asia said the lack of any clear successor could be more of an effort to ensure continuity and stability at a time when the Communist Party is clearly concerned about its integrity and fractures in society. From top from left to right, President Xi, Premier Li Keqiang, Li Zhanshu, director of the General Office of the Communist Party, Vice Premier Wang Yang, From bottom from left to right: Wang Huning, director of the party's Central Policy Research Office, Zhao Leji, head of the Central Organization Department responsible for job assignments, and Shanghai party leader Han Zheng, a veteran manager of the country's financial hub. Neill said that perhaps for now the Politburo will be the place to watch for possible successors. “When we look at the broader Politburo, I think he wants to incubate a few people in there. And over the course of the next five years you may see one or two individuals coming to prominence,” Neill said, adding the move might also be part of an effort to stamp out factionalism or get it under control. Party factions played a key role in Xi and Li’s succession. There are other possibilities too, he adds. “Maybe he’s not satisfied at this very moment that there is somebody worthy of being his heir,” Neill said.